-The first team tosses the flying disc ,aiming it towards a bottle/can that is placed on top of the stake opposite of them.Then the other team throw the flying disc at the first team's bottle/can. 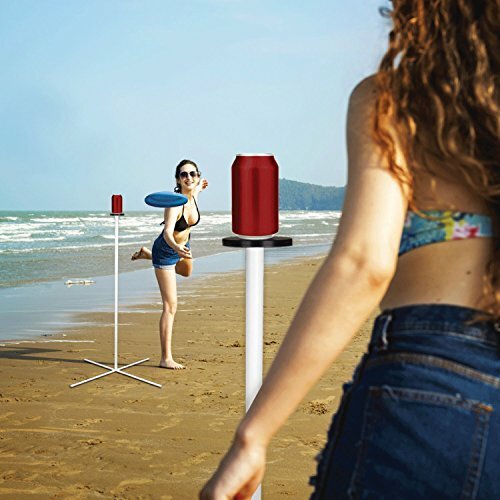 -Point are scored when the flying disc hits the stake or the bottle/can,when the bottle/can is knocked off the stake and hits the ground,or when the receiving team fails to catch the flying disc. -Play continues untill one team has reach 21 points and beats their opponent by at least 2 points. -Flying disc must be caught every throw and bottle/can must be caught if hit. If you are unhappy with this product for any reason,please don't hesitate to contact us immediately and we'll try our best to help you.Thanks! Quick to install: This frisbee game set can be easily set up well in minutes and can be played on 20, 30, or 40 foot long areas depending on skill level. Universal use: Leave the video games and phone inside. Enjoy hours of outdoor fun with your family and friends! Ideal for endless backyard fun for the whole family, tailgating, camping trips, the beach, and more. Fun team game:This lawn game is perfect for team building activities.You can create your own carnival game at tailgates, barbeques, or any outdoor event for hours of entertainment. Develop body coordination :Designed with an emphasis on accuracy, this disc toss game is a great way to develop hand-eye coordination and improve precision. Safe and high-quality material: The frisbee and the pvc poles is made of safe and reliable Eco-Friendly Material. If you have any questions about this product by ROPODA, contact us by completing and submitting the form below. If you are looking for a specif part number, please include it with your message.